You’ve been racing for months now, but it’s likely that your big race is fast approaching. Whether that race is a local sprint-distance race or an Ironman event, you should be looking for one last jump in fitness to get you peaked for your best race of the season. What areas can you improve upon in order to finish the season strong? The following four workouts will help you light up the bike course and have energy left over for the run. This intensity level is key for triathletes of all distances. Your Functional Threshold Power (FTP) is the intensity level at which lactic acid accumulation in your blood exceeds your body’s ability to remove it. Studies have shown that trained athletes can race at their FTP for about an hour. By training at or just below your FTP, you are training your body to work hard and to remove the lactic acid from your blood, effectively increasing your FTP. After training at this intensity level, you will be able to produce more power, and therefore speed, at any given intensity below your FTP. Threshold intervals are the ideal workout for triathletes who are trying to increase their frunctional threshold power (FTP). These intervals should be done at a perceived exertion of about 8 out of 10, and will be difficult, but not maximal, efforts. Pedal cadence should be roughly the same as your racing cadence, optimally in the 85-95 rpm range. Ideally, you will work up to a total of about 60 minutes of these threshold intervals by the time of your goal race. They can be divided into 6x10, 4x15, or 3x20 minute intervals and recovery should be nearly equivalent to the length of the interval. Short-course racers should focus on the shorter length intervals, while long-course racers should strive to complete the 60 minutes in 1-2 intervals. 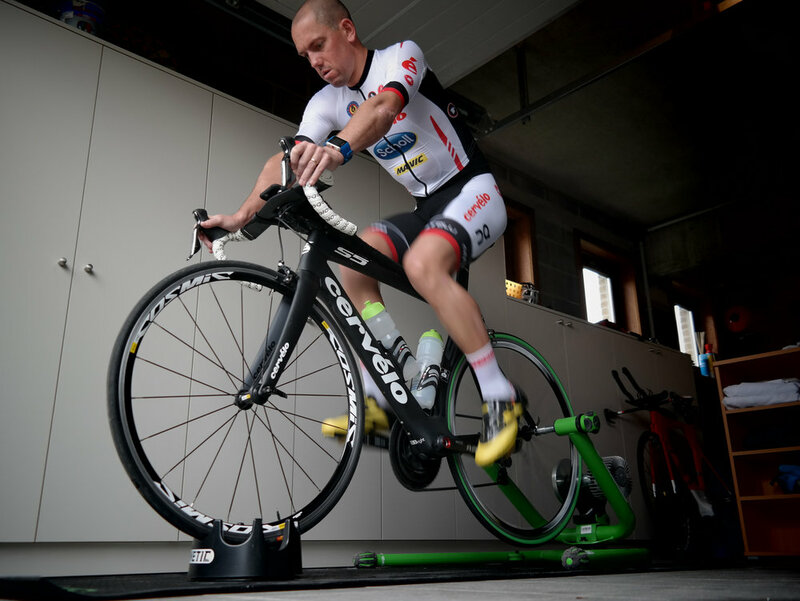 While training at or below your FTP is great for increasing the amount of time you can race at that intensity, if you can raise your maximal power production and aerobic capacity, it will allow your FTP room to improve as well. VO2 Max Intervals are short, maximal efforts that are designed to improve your maximal aerobic capacity or VO2 max. The goal is to increase your top end speed and power. Pedal cadence should be higher than you would normally maintain in a race; above 110 rpm is ideal. Typically, the total amount of time spent performing VO2 Max intervals will amount to about 20-30 minutes by the time you begin tapering for your goal event. These intervals can be divided into 8x2, 6x3, 5x4, or 4x5 minute intervals and recovery should be equivalent to the length of the interval. As interval duration increases, the intensity must decrease in order to complete each interval. Racers of all distances should start their intervals at 1-2 minutes in length and strive to complete intervals 4-5 minutes in length in the month leading up to their goal race. The weeks leading up to your goal event are the perfect time to focus on increasing power at intensities that are just above FTP. These workouts will be crucial for short-course racers, as well as long-course racers whose goal events have many turns, short hills, or turn-arounds. These intervals are also useful for improving lactate buffering ability, or lactate tolerance, which allows you to surge above your FTP, accumulate large quantities of lactic acid, and recover faster. Within a few weeks of beginning this workout you should be able to complete 2-3 sets of intervals with 5-10 minutes of recovery between each. Super-Threshold Criss Cross Threshold is another workout that will train your body to recover from high levels of accumulated lactic acid and increase power just above FTP. Criss cross refers to criss-crossing between power zones just below and above your functional threshold power. You will spend an amount of time just below your FTP at the tempo or threshold level, and then immediately increase the intensity to a level just above FTP for a brief amount of time before returning to the lower level. This criss-cross pattern is repeated several times within each intervals. The lower portions of the interval should be 2-10 minutes in length and the higher-intensity portions should be 1-3 minutes in duration. During this time of slightly less volume and increased intensity, rest between workouts is very important. While you’re performing intervals at and above your FTP, it’s possible to wear yourself out easily without proper rest and recovery. Be sure to allow 24-36 hours of recovery between lactate threshold interval sessions and 24-48 hours of recovery between sessions above lactate threshold. This will allow your body to replenish it’s carbohydrate stores, eliminate lactic acid and other metabolites from the blood and muscles, and your mind to get mentally prepared for another session.